The tips and tricks to enjoying your karting . When starting karting there are so many things to learn , and if you are not mechanically inclined some of it can be rather obscure. Following are some useful tips that have served my customers well over the years. From local club racers all the way up to multiple times Australian Champions, all of them get a grasp of the little things that you need to know how to do to be able to enjoy any day at the racetrack. Simple one first , the front-most floortray bolts need to be facing upwards. The picture shows the result of a bent floortray , and its mounting tab, if the bolt extends down by being a bit long or if the nut and washer are so thick they contact the ground. The worst outcome is the flootray tabs will break off, either from repeated contact of the bolt with the track, or from being bent back straight again once too often. 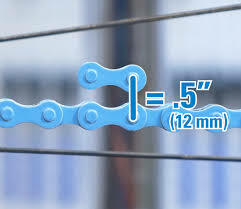 Chain tension needs to be equal to the up and down of 2 widths of your chain. With clutches fitted to almost all karts now, the chain cannot be pulled so tight that it causes the clutch drum to be tilted one way which is what happens if there is not enough slack in the chain. Cut a 12�/300mm steel rule down to 240mm long to allow it to be used as a straightedge to align your chain and sprockets. This is a simple solution to a difficult job, and will only cost a few dollars. 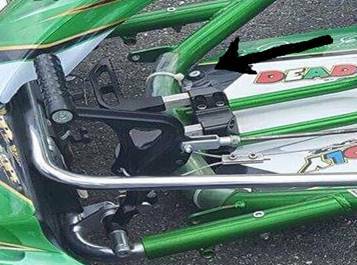 There is not enough distance between the front and rear sprockets, or inside the chainguard, to allow a full 300mm rule in there, and the 240mm long one will still be useful for other jobs on the kart. Remove the washers under socket head bolts that are used to clamp alloy hubs and sprocket or brake disc carriers. This is a cure for a problem that does not show up for a little while, but every time the pinch bolt is tightened on a hub the small washer gets distorted. After a while its ID will shrink so that it then becomes threaded to the size of the bolt which means the bolt is tightened up to the steel washer as much or more than it is into the hub. The next problem arises once the washer has been squeezed still more, the OD will increase and then put outward pressure on the hub and even cut into it causing it to split and eventually break. There is generally not a lot of meat on the outer side of a pinch bolt so the hub is weaker in that area and will be cracked by the pressure. Loosen off the brake rod clevises so that they can �rotate� freely on the levers. On some karts there is just a pin and a spring clip holding the brake rod onto the pedal and/or master cylinder levers that the clevis is able to rotate on, but if you use a bolt and nyloc nut the bolt needs to be able to rotate. When the brake pedal is pushed down, if the clevises at either end are bolted up tight they are not going to want to return after the pressure is let off the pedal. A driver�s foot is very strong so it will always push the brake on, but the release relies on very weak pad return springs, or even just the suction of the seals on a self-adjusting caliper. All fuel lines need to be clipped in place, and at both ends. This can be done by tie-wire, cable ties or even proper clamps. Yes that is what the rules say , but you may say what could go wrong if it is not ?? You might ask the Aussie who lost a world final in Europe many years ago when his unsecured fuel line simply fell off his carb on the last lap while he was leading the race, only to stop and not finish at all !! This is the one thing that should top any preparation list. All overflow bottles need to be vented, either with a hole in the cap or in the top of the bottle. This sounds obvious, but with everyone assuming the plastic bottle they bought off the shelf was already prepared for just that job, it may not be. Do not assume it is already vented, check it. And if you lose a cap and replace it, check if that needs drilling. Drill a 25mm to 30mm diameter hole in your floortray below the lower steering column fixing nut. This can be the single most difficult job to perform in a hurry on a kart, replacing a bent steering column at a racetrack after an incident is a tough one. The nut needs to be accessed from below and to have to remove the floortray because there is no access will just waste so much more time. Put a sticker over it if you must hide the hole. Drill one or two drain holes in the bottom of the seat. These can be 6mm to 8mm in diameter and they are simply to let the water out on a rainy day. The driver will not drown in there, but no point in having him swimming in it. Undo all of the nuts and bolts and �stuff� on your kart at some time, at home or in the workshop away from the racetrack. It does not have to be everything all at the same time, do it over a period of weeks or months. This ensures that the nuts and bolts are not rusted in place, or that the heads of bolts have enough depth to allow a spanner or allen-key to actually grab and undo or tighten them. Half worn off �things� beneath the kart are not noticed and bother no-one, but when you must remove anything in a hurry you trust that they will move. At a racetrack you do not have the range of tools to take 3 goes to grab a bent or rusty bolt, so checking all over the kart each few months can save you from an impossible situation just when you have no time to be messing around.